The term “bottle episode” refers to an episode limited in the number of characters and its setting, originating with the 1960s Star Trek where the term referred to episodes only shot on the starship Enterprise. More than Meets the Eye shares one thing with that old classic sci-fi series, in that it also takes place in outer space and since Roberts likes to use other TV series terminology, like splitting his issues up in “seasons” and “multiple episode story arcs” it wasn’t surprising when he announced that he was making a “bottle episode”, to be a bit of calm before a greater storm. 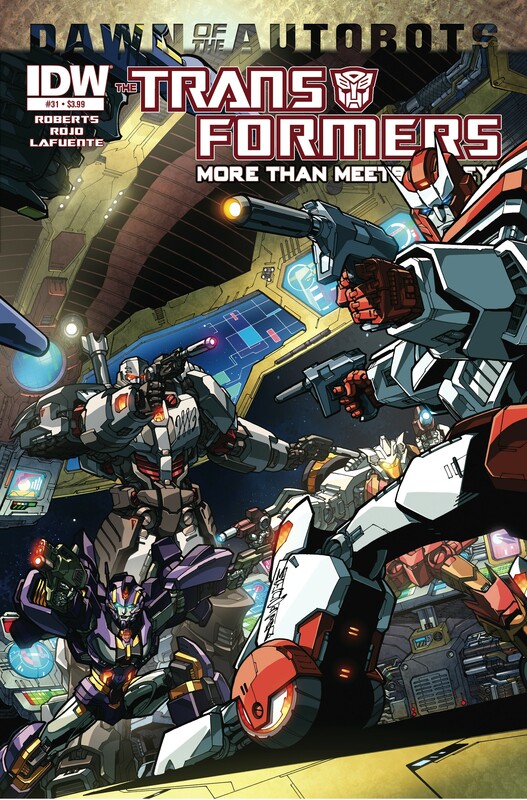 The story in this issue was set up nicely in the last issue when the disappearance of the Lost Light forced the entire crew to split up into shuttles and in this issue we get to experience the aftermath on one of those shuffles, the Rod Pod. I am not entirely surprised that this is the one with Megatron onboard. In TV land a bottle episode is often a way to save money for bigger episodes, but as the creator of Breaking Bad put it about their bottle episode, its limited setting and characters allows for a slower pace and a deeper exploration of character traits and motives. This seems to be a view shared by Roberts, for right off the bat we get a flashback retelling of when Drift found the Lost Light (and how he named it, but that you will have to see for yourself), prompted by Nautica who expresses a curiosity and wonder about the ship and its special engines. And then as crew members on the shuttle begin to disappear one by one, sparking animosity among the remainder, an investigation into the matter launched by Nightbeat, gives us fresh insight into the individual characters and their background, as the detective tries to figure out why some disappear and why the rest are left behind (spark type? how were they created?). Some fascinating facts are revealed that we might never have found out in a sensible manner otherwise, like how Tailgate is the first to suspect Megatron and point a gun at his head (sparking a bizarre Mexican stand-off), the smallest and youngest of them the least forgiving and yet still so very brave (a similar bravery which he showed when facing Tyrest). We also find out what happened to Ravage, who we knew was hiding somewhere on the ship (turns out it was inside the New Rod Pod), who stops the Mexican stand-off, which in turns gives us a panel where Megatron can have a very private and secret conversation with the feline Decepticon through a ways of communication introduced in the first flashback, through touch. It does seem the former Decepticon leader has a plan of sorts, though exactly what it is we cannot be certain off, only that he does not seem displeased to have Ravage there, to share his thoughts with. We also get some more information about those constructed cold, that the latter waves were named for the military campaign or battle which prompted their creation. Nautica makes an interesting observation, that so many Autobots owe their lives to Megatron in that respect, as they would never have been born without those battles which required more soldiers. More tidbits of interesting information, bits of culture and behavior is offered to us like morsels on a fork, while the mystery of the disappearing crew members run its course. As someone who loves a bit of good world building I enjoyed this quite a lot, yet I know in any other format this kind of exposition would have come out clunky and info-dumpy. Panic spreads as more characters vanish, while Nightbeat keeps scratching his head, we even discover that the other shuttles are vanishing too, when Ultra Magnus pops in via holoform for a brief few minutes. Finally, but a little too late Nighbeat falls upon the solution; those who vanished were all part of the original crew, who were there on board the Lost Light when she first launched, all the rest who joined at a later date and time (including weapons and body parts acquired later as well) are spared. Megatron barely has time to yell at Nightbeat for being so slow when they arrive at their intended destination and rendezvous point. And outside the Rod Pod’s windows is nothing but wreckage, large and small chunks of space ship as far as the eye can see. The fact that they label the next issue as “House of Horrors” is not at all encouraging. I’d say Roberts used the bottle episode concept to its full extent, not only did he offer us a bit of a breather before plunging us into some scary, dark territory, he did it while also adding more interesting bits to the Transformers mythos and the characters themselves. There is only one slightly critical remark I have of this issue and that is the art. This is drawn by Atilio Rojo and though the art is perfectly adequate, it’s not quite Milne and some of the characters look slightly off model at times. I can’t say I look forward to next issue per se, since all signs point to disaster and heartbreak, but the overall story is so good that I am willing to suffer some pain to get to the good stuff James Roberts always has to offer. And a bit of fridge brilliance, which came to me only as I was reading your recap: the reason that the Rod Pod didn’t disappear — the shuttle itself — is because it, too, is new; last issue, Rodimus talked about how the crew had replaced the one that was lost during Dark Cybertron. Gosh, I love this comic.